For me, one of the biggest attractions of traveling is being able to sample foods from different parts of the globe. Each nation, even each city, has its own way of cooking and use their own ingredients to lend uniqueness and a distinct flavor to a certain dish. Even the same dish will taste different when cooked and eaten in different cities. A foodophile like me watches countless culinary travel shows so that I, myself, can try the best gastronomic dishes a city has to offer. So, long before my trip to Hanoi, Vietnam, I watched two episodes of “No Reservations” hosted by the suave and funny Anthony Bourdain, as well as a the show “Street Food Around the World”, hosted by the lesser known and not as entertaining, Ishai Golan. Pardon me but I am quite partial to Anthony, he is my ultimate travel god. During his visit to the streets of Hanoi, one of the places he went to was Cha Ca La Vong to sample a dish called grilled fish. So, I quickly put the restaurant on my list so that I may also sample the glorious dish, which has often been exalted on the Internet. Nevermind the not so happy reviews of some people, I was going to have a bite or more of the supposedly majestic dish. When you expect a lot, you often get disappointed and this happened when we went to Cha Ca La Vong in the old French quarter of Hanoi. However, I have an open mind and I am going to write a fair review of the dish, as well as the restaurant. First, I am going to talk about the place. We arrived by taxi as we got lost and couldn’t find our way. The dutiful driver took us there without even a single word. He spoke no English and understood little of the language. There was an old man at the door when we arrive and he quickly handed us a small laminated piece of paper with a note saying that the restaurant only serves one dish, which is called grilled fish. Having come from a country which has rice as the staple food and having been in Vietnam for four days filling our tummies with different kinds of noodle dishes and French baguette with meat inside, we were craving for a dish with rice. We asked the man if they served rice and he just waved us off and pointed us inside so we obliged. We went to the second floor and waited for our order, anticipating all the flavors and goodness we would soon savor. The restaurant must just have opened recently as there was no one else there but us. We waited for like 20 minutes until a lady came in and started placing bowls and baskets of fresh vegetables. When she saw us she asked us if we wanted to eat. Apparently, the old man at the door never told her that there were already customers waiting. When we answered her yes, she replied that the charge is 170,000 Vietnamese dong per person or roughly $8 per person. Slowly the crowd started trickling in, most of them tourists from countries all over the world, all waiting to pass their very own verdict of the famed grilled fish. 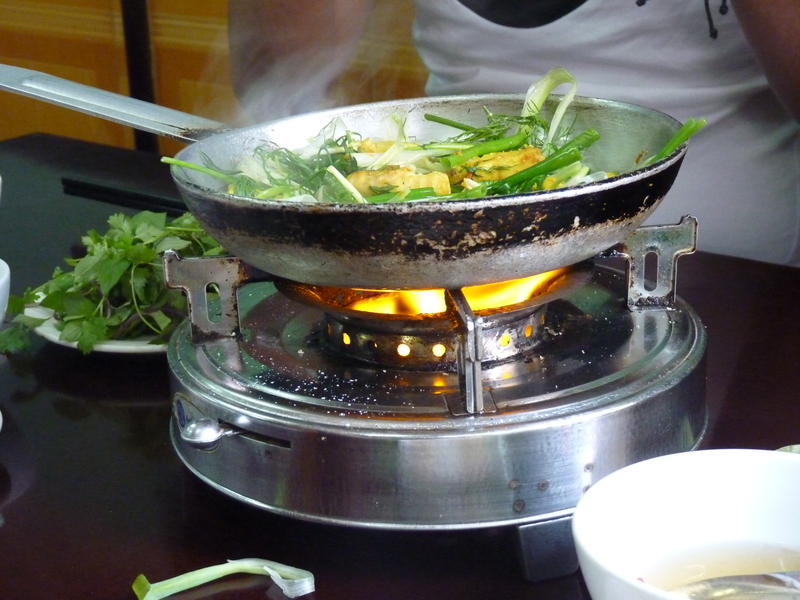 The staff then started placing these little stoves on each table with little pans that had small cuts of fried fish on it. 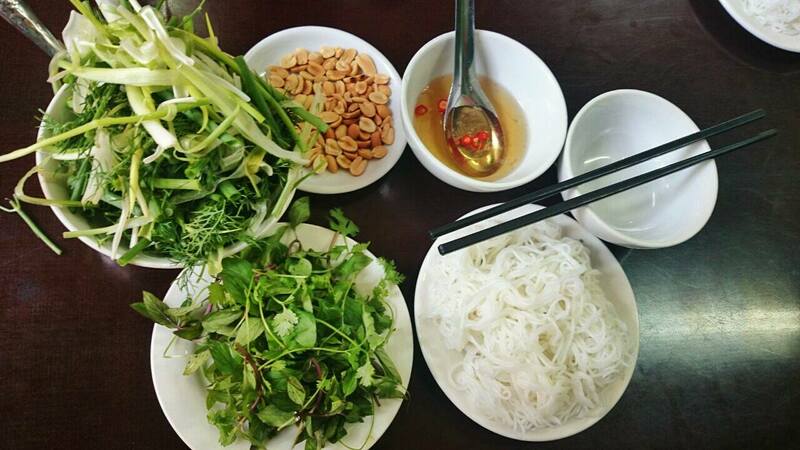 They also gave each person on our table a plate of rice noodles and two plates of a variety of leafy vegetables. We were disappointed when we saw the fish because the size were too small and the portions not too generous. When they said grilled fish, we expected a whole fish for each person and we expected grilled fish, not fried fish. The proprietor then started to teach us hot to prepare the dish. We looked at the people on the other tables and started doing what they were doing. When we were satisfied that we had cooked the dish just right, we started eating. However, we were quite disappointed with the taste. It was ok but it paled in comparison to the other dishes, which we have tried in the city. It was not something which you would make an effort to come back to again and again. So, what is my final verdict on grilled fish and Cha Ca La Vong? You just need to completely forget about it. When you are in Vietnam it is better to try the other dishes recommended by the man himself, Anthony Bourdain, such as Pho Bo and Banh mi. Your stomach will be happier and more satisfied.